Alex Kelly’s internationally renowned Talkabout books are a series of practical workbooks designed to develop the self-awareness, self-esteem and social skills of people with special needs. The three Talkabout for Children books, now in their second edition, are specifically designed to provide a foundation of social skills through which children can grow and develop with confidence. 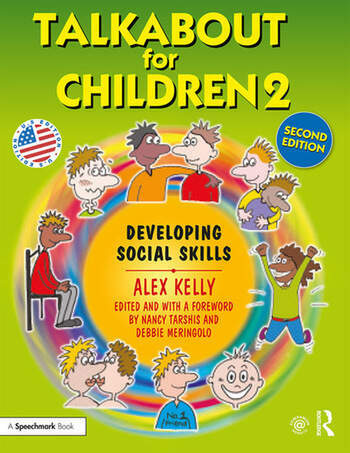 Revised for US professionals, and with a new Foreword by Nancy Tarshis and Debbie Meringolo (Altogether Social LLC, New York), Talkabout for Children 2 focuses on social skills including body language, talking, and assertiveness. This book is an invaluable resource for therapists, teachers, child psychologists and all professionals looking to develop the social skills of children aged 4 + or children with special needs. Debbie Meringolo, a special educator, clinician and developmental specialist, is the Director of Early Childhood Programming at Quad Preparatory School, a school for twice exceptional children, Grades K-12. She assumed this role in July 2018, after a 27-year history as the Associate Director of the Infant/Toddler Team and RELATE program at the Rose F. Kennedy Center Children’s Evaluation and Rehabilitation Center of Montefiore. Prior to her current role at The Quad Prep, Debbie served as a consultant, bringing social cognitive programming to the school, developing the social emotional learning program and training staff members. Debbie has a long history working in schools as a reading specialist, supervisor and program developer in the New York City Department of Education for many years. She also runs a part-time private practice, Altogether Social, along with Nancy Tarshis, for children ages 14 months through adulthood. They provide individual and group sessions, consult to public and private schools and training for parents and professionals. Debbie is an enthusiastic speaker who enjoys sharing her own clinical experiences with audience. She has been speaking about social cognitive development, preschool and school age play skill development, assessment and intervention, diagnosis and treatment of individuals with social learning challenges, and developing social programming across the age range across the country.